I don’t watch a lot of baseball. Living in Canada, hockey is my game of choice. However, I do know a little something about curve balls. The curve ball is a type of pitch in baseball thrown with a characteristic grip and hand movement that imparts forward spin to the ball, causing it to dive in a downward path as it approaches the plate. It takes quite a good pitcher to throw one accurately and it takes an equally good batter to knock a curve ball out of the park for a home run. The key to a curve ball is that it is generally unexpected. The batter doesn’t realize it’s a curve ball until it makes that dive down crossing the plate, and then it’s too late to make the proper adjustment in stance etc. to make contact with the ball. That’s when he remembers all the good coaching he has received when faced with a curve ball. Sometimes life will throw you a curve ball. It’s a common saying. You expected life would go in one direction but then you got hit with a “curve” and you totally did not expect it! The loss of a job, a marriage break-up, the death of a loved one. Unmet expectations, disappointments, heartache, loss – the curve balls of life. I’ve stared down a lot of curve balls in my life. Many times God has thrown me a curve ball. He has allowed things to happen that I wasn’t expecting – a couple of miscarriages, job losses, cancer, heartache, and loss. If I take this analogy to it’s logical conclusion, I must also believe that if He is THE great Pitcher, He knows exactly what course the “ball” is going to take. He’s in control. That said, I don’t like curve balls. I’m being totally honest here. I don’t think anyone likes them. They mess me up! 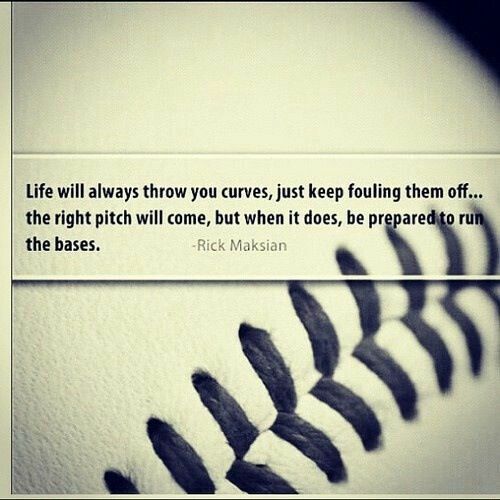 I’ve thrown my bat down frustrated and discouraged because those curve balls are just too hard to deal with. I’ve yelled at the Pitcher (God) and raged at the unfairness. Times of trial bring out some very unsportsmanlike conduct in me and that’s when I remember that not only is God the “Pitcher”, He is also the great “Coach. What does my Coach want me to do when I’m faced with a curve ball? I have two choices when life throws me a curve ball: drop my bat and give up, or pick it up and take my stance again. It’s not always the easy way, but it’s the only way! It’s the curve balls that determine my character and my stamina. Am I in this for the long run, or do I only want to play the game if it goes my way? This entry was posted in Proverbs 16:9 - Journey Thoughts and tagged baseball, Batter, curve balls, Pitcher, Proverbs 16:9. Bookmark the permalink.